What a great Halloween fabric to decorate your spooky house. Beautiful colors in shades of orange, yellow, purple, red, browns and black. You will find a fun little witch riding across the fabric on her little broom with her kitten helping to get her off the ground. Such a scary vampire lurks on the fabric with his quirky little vampire bat. Kittens napping and nestled in between the pumpkins with spiders trying to scare them away. Two stripes measure 12 inches wide and 2 and two stripes measure 7 3/4 inches wide. 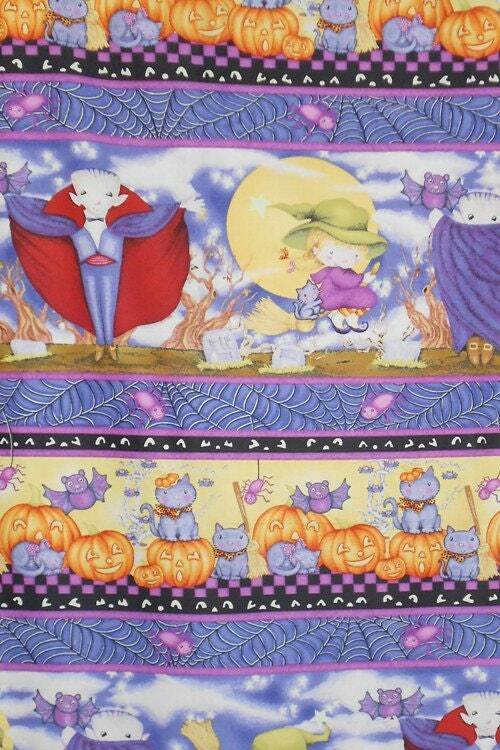 Don't miss out on this fun Halloween fabric. All fabric from The Quilted Nursery Children's Fabric Store is cut directly from the bolt and we now offer fractional yardage cuts for your convenience. Any shipping overages are refunded upon shipment of fabric. I love this fabric! The colors are beautiful and the pattern is adorable! It shipped immediately and arrived a few days later!